There are some whiskies you know are going to be excellent just from a wee sniff of the bottle (or the sample bottle, as I’ve shared only a bit of this). A 29 year old Cragganmore, what can go wrong, right? Nothing as it seems. This is a lovely dram indeed. 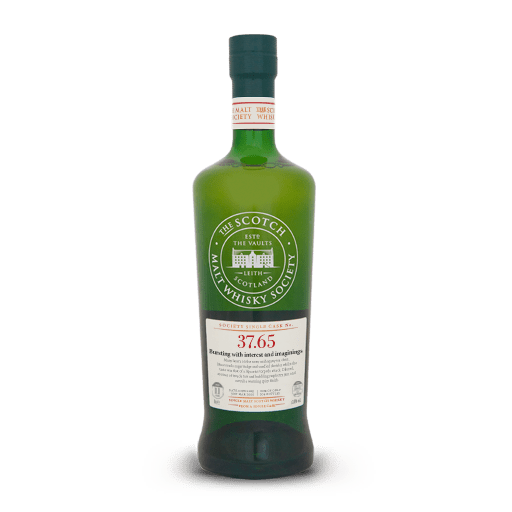 192 bottles made, and shockingly there are still some on sale on the SMWS site (here).This baby comes from a re-fill Ex-Bourbon Hogshead,bottled at 46.5% (not much, but it feels right), distilled 19th December 1985. Nose : Oh yeah. This is what I like about old whisky. Classic older malt here, with lots of old wood, library shelves, tons of old leather bound books, dusty and waxy as hell. Beautiful. A nice ripe orange feel to it too, and a perfume like quality mainly on flower petals. Palate : a nice creamy backbone with lots of old wood, coconut, and some spice the wax and old furniture reign with a hint of grapefruit and butterscotch candy. Deep and rewarding. Finish : Wood, grapefruit and buttery coconut. This one is heavy on the wood, old style wood, which I happen to love, some perfumed notes and a nice creamy palate with the grapfruit balancing out. Highly recommended. and still available. Try to find yourself a bottle of the 30 year Cragganmore. Nose – amazing storng fruit cake.